Washington, DC (LifeNews.com) -- A leading pro-life group that educates about the vaccines that are based on the cells from babies killed in abortions is worried about a new decision from the pharmaceutical giant Merck. The company has decided to stop producing some vaccines that are not made based on fetal cells from abortions. Merck & Co. Inc has stopped the production and sale of its monovalent vaccines for measles, mumps and rubella. "Fetal Tissue and Vaccines. Some vaccines such as rubella and varicella are made from human cell-line cultures, and some of these cell lines originated from aborted fetal tissue, obtained from legal abortions in the 1960s. No new fetal tissue is needed to produce cell lines to make these vaccines, now or in the future." [[Note, some new cell lines have been added recently such as PER C6. For some details, see cogforlife.org. --Aborted Fetal Cell line Vaccines, Ethics, Source list, Alternatives to Merck, Gardasil, etc. ABORTED FETAL CELL USE IN RUBELLA VACCINES: A MEDICAL AND ETHICAL CONFLICT by Laurence F. Roberge, M.S. URL ADVERSE REACTIONS to immunizations are more common than many people realize. Is your child HIGH-RISK or contraindicated? THINKTWICE! Also has description of Prevnar trial in Finland, with comparison to California (Kaiser) trials re Otitis Media (ear infections). URL How to Report: Reporting by Medical Product Manufacturers, Distributors, Packers and User-facilities [Reporting required by law or regulation] Web page created 2000-DEC-05. 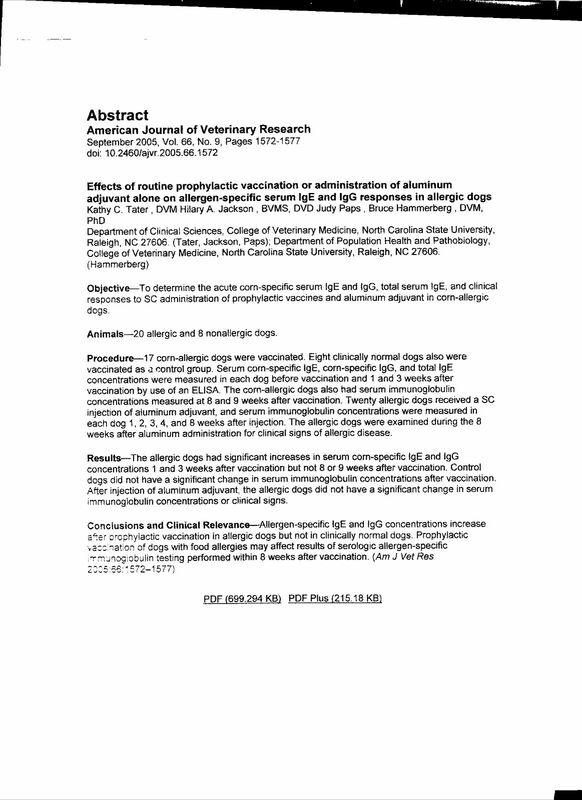 Possible adverse reactions to vaccinations in dogs and cats, include anaphylaxis, lameness, vaccine associated fibrosarcomas, fever, and birth defects. "Anaphylactic reactions are more commonly associated with the use of killed vaccines such as rabies, canine coronavirus, feline leukemia virus and leptospirosis. Killedpeer vaccines have more virus or bacterial particales per dose and have added chemicals (adjuvants) to improve the pet's immune response." URL The manufacturer of the anthrax vaccine, BioPort Corp. of Lansing, Mich., has failed to properly track or investigate serious adverse reactions by people being inoculated, a recent federal study re... " The FDA said that many complaints of adverse reactions to the vaccine from members of the armed services were not being tracked or investigated by BioPort. " Anthrax Vaccine -- more horror stories. ThinkTwice.com/Studies.htm This immunization site contains many questions and comments pertaining to vaccine risks and ADVERSE REACTIONS. Please visit this important resource. URL Chief Medical Officer's Urgent Communication CEM/CMO/2000/08 giving background information about the safety of meningitis C vaccine and advice for parents. Click for Home page Childrens Health/Child Immunizations/Guides &Directories Get Informed - E-News Vaccines, immunizations or inoculations are recommended for every child born in the United States. A vaccination shouldn't hurt a child but sometimes they do. URL The hepatitis B vaccine has been linked to neurological disorders, multiple sclerosis, and death. In spite of medical denials, research indicate a likely connection. URL http://www.shirleys-wellness-cafe.com/v-kaiser.htm Experiments and adverse effects. New vaccines for allergies are being made. However, there are safe, economical, drug free methods for Allergy Relief. Swedish researchers think the aluminum added to many vaccinations as an "intensifier" has caused an increasing number of people to become allergic to the metal. And, with aluminum in everything from medications and deodorant to make-up and more, it's not an easy allergen to avoid. STAFFORDSHIRE, England —In early December 2017, Dr. Chris Exley of Keele University in England and his colleagues published a paper that for the first time looked at the brain tissue of subjects with autism to determine the level of aluminum (note: they spell “aluminum” as “aluminium” in the United Kingdom) found within their brain tissue. A new French documentary that exposes the widespread use of aluminum in vaccines--used since the 1930s with minimal testing--and the toxic side effects. "The low toxicity of the higher dosages appears to be a consequence of dosage-dependent inflammation at the injection site. The high dosages caused intense inflammation at the injection site, forming “granulomas”." Fluoridation Practices - A Missing Link in the Vaccine Autism Connection? New, so-far-unpublished research led by Vancouver neuroscientist Chris Shaw shows a link between the aluminum hydroxide used in vaccines, and symptoms associated with Parkinson's, amyotrophic lateral sclerosis (ALS, or Lou Gehrig's disease), and Alzheimer's. "Did autism rates improve after mercury-laced vaccines were discontinued? Soon thereafter, the CDC also added pregnant women in their first trimester to the list of people officially recommended—and actively encouraged—to receive mercury-laced flu vaccines.5,6"
Note: In 2005, 5 years after conference attendees spoke out about a lack of data on the effects of mixing different metals in childhood vaccines, Dr. Boyd Haley, former professor of medicinal chemistry and chairman of the chemistry department at the University of Kentucky, published a study in which he investigated the effect of combining aluminum hydroxide with thimerosal. 52 In this study, cultured neurons showed no significant cell death six hours after they were exposed to just aluminum; more than 90% survived. Thimerosal alone also caused few neurons to die after six hours of exposure. Again, more than 90% survived. 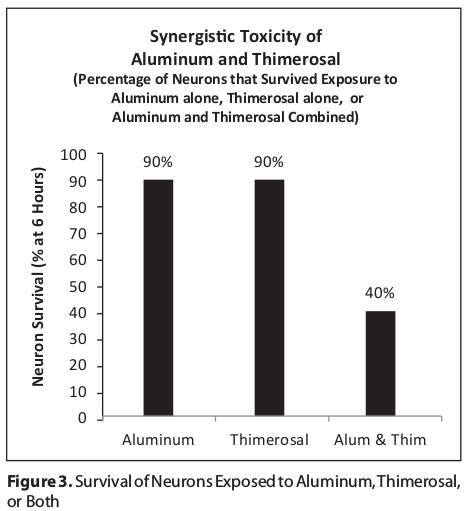 However, when cultured neutrons were exposed to aluminum and thimerosal, only about 40% survived after six hours, clearly demonstrating synergistic toxicity (Figure 3). Macrophagic myofasciitis is characterized by a stereotyped and immunologically active lesion at deltoid muscle biopsy. Electron microscopy, microanalytical studies, experimental procedures, and an epidemiological study recently demonstrated that the lesion is due to persistence for years at site of injection of an aluminum adjuvant used in vaccines against hepatitis B virus, hepatitis A virus, and tetanus toxoid. Aluminum hydroxide is known to potently stimulate the immune system and to shift immune responses towards a Th-2 profile. It is plausible that persistent systemic immune activation that fails to switch off represents the pathophysiologic basis of chronic fatigue syndrome associated with macrophagic myofasciitis, similarly to what happens in patients with post-infectious chronic fatigue and possibly idiopathic chronic fatigue syndrome. What is similar to canine & human atopic dermatitis? Teresa Binstock: Aluminum in vaccines has widespread effects. URL Global Vaccine Awareness League helps to educate before you vaccinate. "Note: Active immunization against diphtheria or tetanus should be undertaken during convalescence from diphtheria or tetanus in every patient because these exotoxin-mediated diseases do not necessarily confer immunity." Largely a repeat of the first half of the above article. Hannah Poling Vaccine Autism – re-visited: Curiously, Gardasil vaccine paralysis, Influenza vaccine Gulf war syndrome (and renal failure) and vaccine autism (with no mitochondrial disorder) ALL show the same post vaccine MASS ischemia brain damages as Hannah Poling does including repeat vaccine Alzheimer’s dementia – MASS Disorders. MASS Scales. MASS Vaccines. Improvement in an autistic child after blood test revealed what nutrition was indicated for balance. ... present a balance of information regarding the synthetic food and beverage sweetener aspartame and its link to epidemic illness and death. Dying For A Diet Coke? Welcome to the Vaccine Safety Website. Vaccines have been proven to cause insulin dependent diabetes and many are seeking compensation from the US government for this vaccine induced injury. Arlington, September 11, 2000: Dr. J. Bart Classen, an immunologist at Classen Immunotherapies, presented data yesterday at the International Public Conference on Vaccination which proved vaccines are the largest cause of Insulin Dependent Diabetes in Children. His data indicated that vaccines cause approximately 80% of cases of insulin dependent diabetes in children who have received multiple vaccines starting after 2 month of life. Vaccine Ingredients from Phy.Desk Ref. IAS.org.NZ Preliminary Survey Results: unvaccinated healthier!